The lightest 5.56mm Caliber machingun in the world. 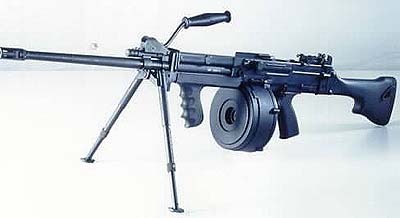 6.8kg loaded with 100 rounds of ammunition. Quick change barrels are pre-zeroed. Three position gas regulator enables the weapon to function reliably in adverse environments such as jungle, sub-zero and desert conditions.